Joe Yes, it's definitely feeling like spring time. 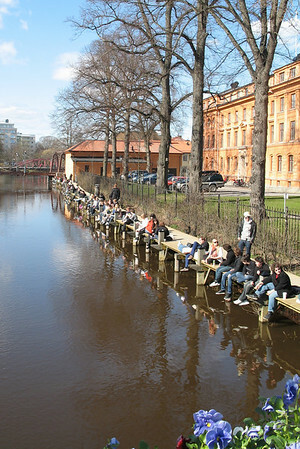 The banks of the river are lined with office workers on fika, and students who appear to be studying how to be on fika, presumably as part of some local version of a high school civics class. Out here in Flogsta, the lawns are filled with cats hunting leaves and tiny insects which may or may not actually be there, as well as Swedish girls playing lawn games which seem to involve making elaborate arrangements of various sized wooden blocks and then occasionally picking one of them up and throwing it at some of the others, no doubt governed by some advanced heuristic beyond my ken. And, of course, the "Puck" has returned, or so the extremely colorful signs at virtually every bus stop in the city inform me. Being a higher primate, my attention is of course immediately attracted by colorful, not to mention shiny, things, so naturally I've been curious about this hockey-puck-like ice cream confection which has, apparently, made it's much anticipated return to the quickie marts of Sweden. So it was that today, on my way home from the grocery store, carrying my canvas sacks full of fresh vegetables1, I decided that such a lovely spring day called for an icy treat, and I got myself a Puck. Mmm, I thought, I haven't had a nice chocolate covered ice cream popsicle in years. Well, I still haven't. If I'd paid more attention to the words on the brightly colored advertising, I might have noticed what I instead discovered to my horror at the first bite: that's not a tasty chocolate shell, it's lakrits. 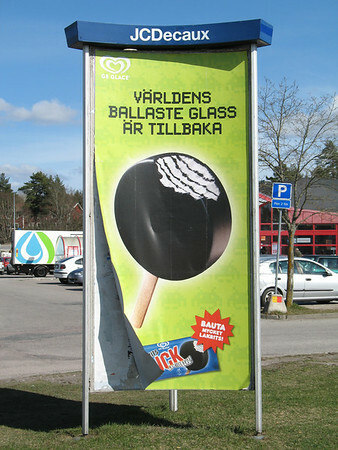 That's right, lovely vanilla ice cream encased in a thin, crunchy shell of salty, salty licorice. I still shudder to think of it. Oh well. At least it isn't actually warm out, yet, seeing as how all of our spring clothes are sitting on a wharf in Jersey. 1 I keep forgetting to talk about the fresh vegetables. Yes, in fact, there is plenty of fresh produce. In the winter it seems to come mainly from Spain, with some other Mediterranean locales thrown in for good measure. Just this week, though, local produce is starting to show up in street stands downtown. Hopefully we'll report back from a Farmer's Market soon.